Althea, as observed by her nephew, Junior. Appearance: Althea’s eyes, dark and almond shaped, stand out as her most prominent feature. She can and often pierces those around her a stare meant to unnerve them in some capacity. She is always studying the world around her, always observant. She has dark hair and a proud mouth, usually painted red in her younger days. She has a long, straight nose and high cheekbones like many of the Womacks, and she and her brother Cal favor one another greatly. She dresses fashionably in her youth, and is a talented seamstress, having made many of her own clothes. Personality: my great aunt, Clara, who was a writer and possible manic depressive. Carrie Fisher. Stephen Fry. Physical: Cate Blanchett in The Good German. Goals/Desires: To become a writer, to not have to depend on anyone else, to control her manic depression, to be the woman she sees herself (established, independent, self-sufficient, successful) even though she doesn’t often have the strength, will, or control to be that person. Often what she sees in her mind is very different from what she is capable of in reality. She also wants “the good life”—to be able to have all the things she wants: books, music, food. Secrets: Althea knows her younger sister has a different father. Quirks: Althea collects pets, especially as she gets older, even though she is physically and financially incapable of taking care of most of them. Because she doesn’t know what other people want or need without their saying so, and hates not knowing, she knows staring can often cause others around her to speak first, and explain themselves rather than her having to let part of her vulnerability show. 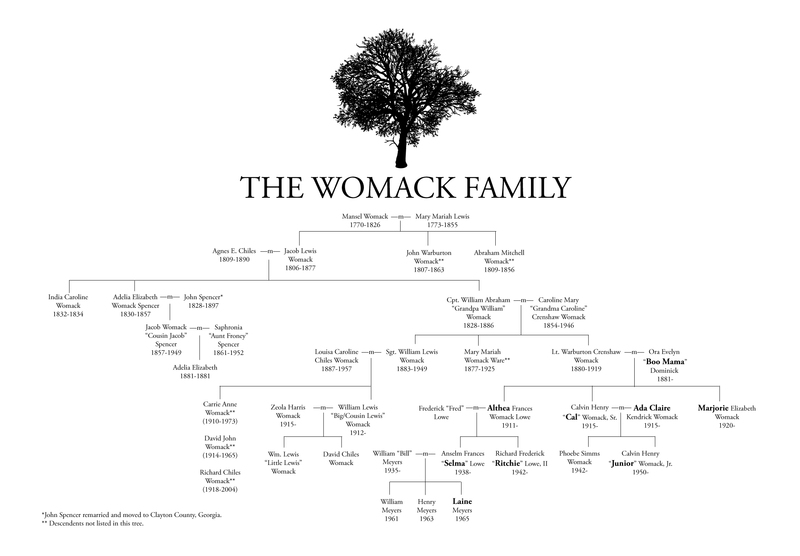 She know she is smart than many of the people around her, and this gives her a deep sense of pride in herself and that intelligence that, like her brother cal, leads her to show that Womack stubbornness that’s so deeply entrenched in their family. She reads voraciously, and she will almost always have a book on her person, or within arm’s reach. She goes through phases of obsession, and will spend months and seasons reading everything she can get her hands on by an author, from their published works to volumes of letters, to diaries, to records of the author reading their work—and during such obsessions will tout that author’s brilliance over all others, to anyone who will willingly (or unwillingly) listen. A brief (very incomplete, but diverse) list: Katherine Mansfield, Walter Henry Thoreau, Vladimir Nabokov, Saul Bellow. For most of her life, Althea struggles with manic depression, though it is not diagnosed and she doesn’t know what to call it. She gives it many names over her life—the wildness within her is the most common. The wildness will build until it comes burst forth in a wall of energy she cannot control, leaving her almost always afterward deeply and almost irrevocably depressed. While she only has a half dozen major manic episodes in her life (that strip her ability to make rational decisions or control herself), she most often varies between mild mania and depression. Her milder episodes leave her restless and sleepless, and it is during these times that she has produced most of her writing. As she ages, Althea medicates her manic depression with alcohol, drinking to dampen the wildness, and then drinking to smother the depression. Religion: Methodist, but doesn’t really have much of a relationship with the Almighty. She doesn’t understand him and thinks he has a habit of making poor decisions. Likes: dark chocolate, tea, most animals (not snakes,) gardening, naming and identifying plants—she keeps a sketchbook/journal of the plants on the Ridge. Dislikes: Willful ignorance—having the means and ability to deepen one’s knowledge and doing nothing to learn more about the world around them.